Meinhardt is one of the few multidisciplinary consultancies in the world. Since 1955, we have led the way in innovative and highly buildable designs. In the growing field of facade engineering, we have a formidable track record of over 20 years of specialized experince across more than 1,300 iconic projects. Our clients can leverage our full suite of integrated capabilities across engineering, system design, and projects economics and access the best expertise available within the Meinhardt group. 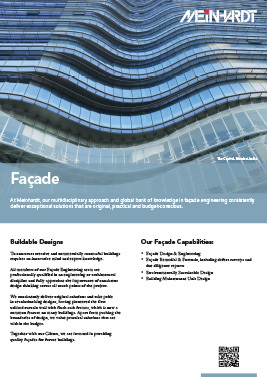 All members of our facade engineering team are professionally qualified in an engineering and architectural discipline and fully appreciate the importance of consistent design thinking across all touch points of the projects.